IoTrix is an App that a individual can use to make a smart Advertisement board . The major objective of this project was to make a smart advertisement board that is power efficient and user friendly to control . Nowadays this outdoor led board's are very common . The Software is predefined and a person can't control it afterwards . I wanted to make an easy to program led board with the help of smart Phone . With Iotrix app we can not only send message but we could send multiple different combinations of message . For example: we can have a counter + Date +Scrolling Message + some double row message . A person can have upto 9 different messages from the widget .Also i have added Brightness control , support for 64*64 led board and ,wifi support and much more. Thus making sure its future proof and at any moment we can change the messages on the board according to some occasion . The value of this app is tremendous as it adds the dynamic way to control the led board in many different ways Making it really smart and Also with brightness control we can save some energy specially in nights where you dont really need that much brightness . Control the Display size from 32*16 to 64*64. The sending of dynamic messages on the LED matrix with an app has never been done. This make IoTrix stand out in the crowd. The only thing I could not achieve was sending GIF images on the LED matrix. Not only can you control the LED matrix but you can also control the LED strips. I have to make sure that you don't have to write the IP address every now and then. The app is smart enough to scan the IoTrix for ESP8266 and connect to it. I also added the scan wifi dialog box that scans the nearby ESP8266 devices. Right now the app filters the ESP8266 only. If you'd like to support the app with RPi or any other device, let me know. I can update the app. P10 LED matrix is connected to Arduino Mega .The reason to choose Mega was Sketch size and Ram to process the Complex json data. The RTC module and DSB1820 waterproof temperature sensor also connected to mega. I could have connected LED Strips to arduino mega.But i choose to skip arduino mega and use ESP01 instead of it. If Arduino Mega gets failed in future. At least the LED strip's will work. Also it does not make sense to use esp just for communication purpose.it has a strong microcontroller build into it . Later I implemented OTA part in ESP too. It can be turned on with Android app. If ESP does not find the previous WiFi network connection, it automatically turn on its app mode. This way we can change WiFI credentials at any time. People have done projects based on sending one message to the LED matrix. With IoTrix, we can do more than that. I have installed this LED board in one of the pharmacy shop in mumbai. With the help of waterproof silicon glue , i make sure that no water gets inside .The size of The board is 2*2 ft .it took me $123 to make this board. This is a Dual Side LED board. Its cheap compared to the market. There are no P10 display in market offers this type of app based feature.One of the major problem this board has is brightness that is 100% and it is not controllable. This is okay, if the board is running in daylight but in night the brightness of this board is too much , that people cant see what is written on the board .This makes the board useless and also power inefficient. When I installed my IoTrix board in the pharmacy shop I realize only 25% of brightness is enough.Making the board visible as well as power efficient. Even the LED strip is running on 50% brightness only. With this Iotrix now any one can make a great outdoor led board which can be control over the samrtphone App. Its Simple to add many different combination of messages without any hassle to dig down into computer and coding every now and then . I am also thinking to add features like Youtube ,Twitter , social media and remote control support in future .So one can control 100's of this smart advertisement board from anywhere. This images gives you how the components are connected to the PCB . 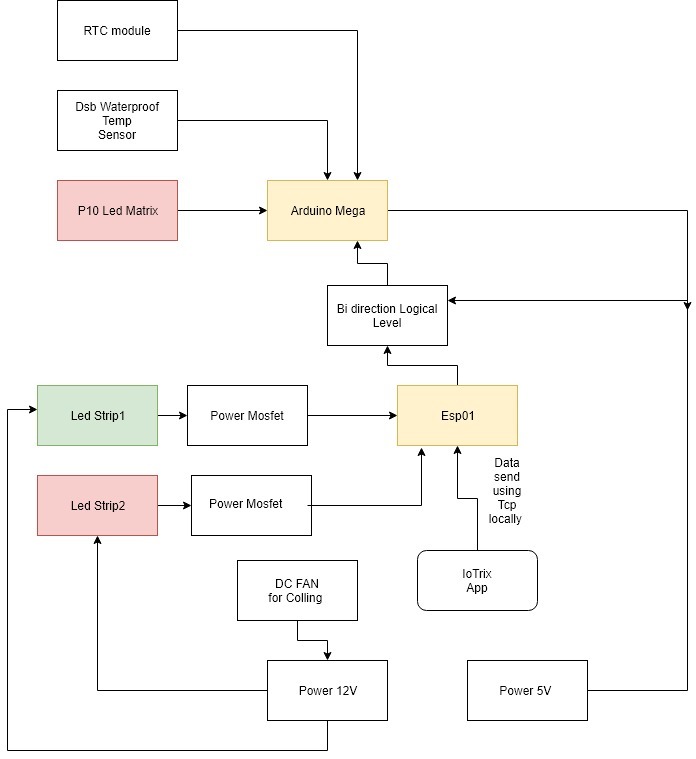 Esp 8266 is provided 3.3v using bi direction logic level . this program also handles Local Wifi ,OTP and Dynamic Wifi Connectivity with App. 4. )The device MAC Address is compare with saved mac address and vendor name for connectiviaty. as host name is not working.THe verification of esp devices is done with unique networking layer in App itself. // EEPROM ADDRESS FOR DATA STORAGE. LocalWifiConnect();    //failed to connect to wifi ,this shows that device is very far or router has been changed .